PREDS-Ophthalmic Suspension (Prednisolone acetate Ophthalmic Suspension USP) is synthetic analog of glucocorticoide hydrocortisone (cortisol), has an anti-inflammatory action for ophthalmic use. Prednisolone Acetate IP	........................10 mg.
Primary packing - 5mL & 10mL Clear Poly bottles White caps &Nozzles. 5mL & 10mL of solution in Clear poly bottles with white caps & nozzles in properly sealed. Corticosteroids inhibit the inflammatory response to a variety of inciting agents and probably delay or slow healing. They inhibit the edema, fibrin deposition, capillary dilation, leukocyte migration, capillary proliferation, fibroblast proliferation, deposition of collagen, and scar formation associated with inflammation. There is no generally accepted explanation for the mechanism of action of ocular corticosteroids. However, corticosteroids are thought to act by the induction of phospholipase A2 inhibitory proteins, collectively called lipocortins. It is postulated that these proteins control the biosynthesis of potent mediators of inflammation such as prostaglandins and leukotrienes by inhibiting the release of their common precursor arachidonic acid. Arachidonic acid is released from membrane phospholipids by phospholipase A2. PREDS-Ophthalmic Suspension is contraindicated in most viral diseases of the cornea and conjunctiva including epithelial herpes simplex keratitis (dendritic keratitis), vaccinia, and varicella, and also in mycobacterial infection of the eye and fungal diseases of ocular structures. 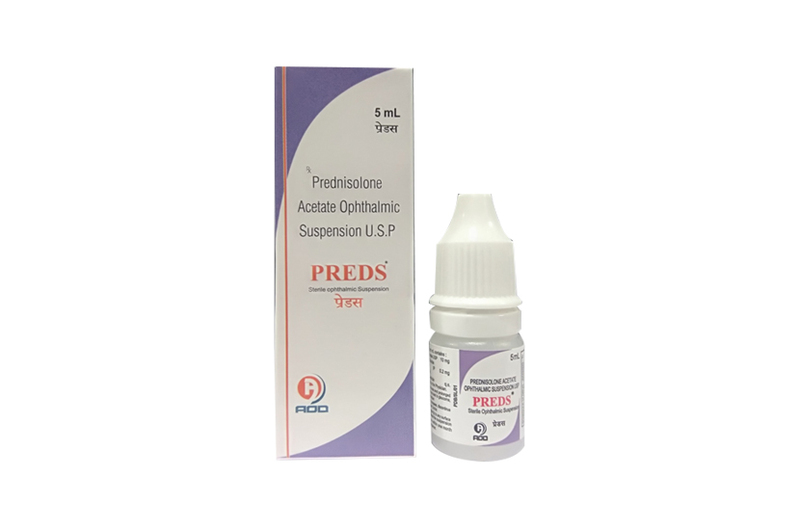 Prednisolone Acetate Ophthalmic Suspension USP, 1% is also contraindicated in individuals with known or suspected hypersensitivity to any of the ingredients of this preparation and to other corticosteroids. FOR TOPICAL OPHTHALMIC USE ONLY. Prolonged use of corticosteroids may result in glaucoma with damage to the optic nerve, defects in visual acuity and fields of vision, and in posterior subcapsular cataract formation. Prolonged use may also suppress the host immune response and thus increase the hazard of secondary ocular infections. Various ocular diseases and long-term use of topical corticosteroids have been known to cause corneal and scleral thinning. Use of topical corticosteroids in the presence of thin corneal or scleral tissue may lead to perforation. Acute purulent infections of the eye may be masked or activity enhanced by the presence of corticosteroid medication. If this product is used for 10 days or longer, intraocular pressure should be routinely monitored even though it may be difficult in children and uncooperative patients. Steroids should be used with caution in the presence of glaucoma. Intraocular pressure should be checked frequently. The use of steroids after cataract surgery may delay healing and increase the incidence of bleb formation. Use of ocular steroids may prolong the course and may exacerbate the severity of many viral infections of the eye (including herpes simplex). Employment of a corticosteroid medication in the treatment of patients with a history of herpes simplex requires great caution; frequent slit lamp microscopy is recommended. Corticosteroids are not effective in mustard gas keratitis and Sjogren's keratoconjunctivitis. The dosing of PREDS-Ophthalmic Suspension 1% may be reduced, but care should be taken not to discontinue therapy prematurely. In chronic conditions, withdrawal of treatment should be carried out by gradually decreasing the frequency of applications. PREDS-Ophthalmic Suspension is supplied in one Clear Polethylene Bottle packed with printed labelled & cartons And Such 25 Carton Packed in a Shrink Sleeves & corrugated box.